Southern Cross Housing provide Social Housing and Affordable Housing across the Illawarra, Shoalhaven, Eurobodalla and Snowy Monaro Local Government Areas. In recent years, we have continued to diversify our services, working to address the disadvantage experienced by many of our applicants, residents and community members. As a result we have created new business activities and formalised existing activities to deliver increased community benefits. Southern Cross Building and Construction is a registered building company which is able to deliver new social and affordable dwellings through a social enterprise, while providing employment and training opportunities for people in our local communities. Southern Cross Realty Services provides pathways out of social and affordable housing where it is feasible for applicants and tenants. Our realty services provide a safety net for people transitioning from social housing to the private rental market. This safety net provides added security and support for tenants to take their next step toward greater independence with peace of mind. Our Realty Services also provide a value-for-money proposition for Landlords, with a range of benefits including a rental guarantee. Learn more about the benefits of leasing your investment property through Southern Cross Housing here. Southern Cross Communities Assist brings together a number of established Community Development and Tenant Participation initiatives, with new projects supporting residents achieve their goals whilst building organisational capacity in data collection, analysis and service impact evaluation. 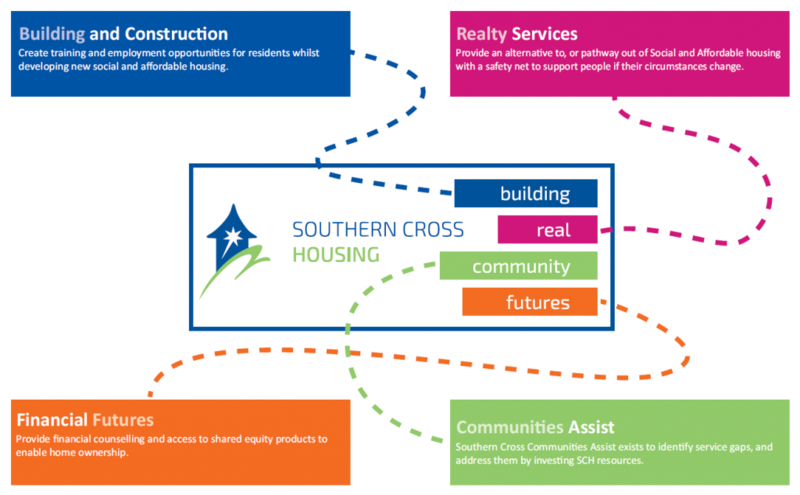 Southern Cross Financial Futures provide service users with specialist resources to plan and realise their financial goals, helping them achieve financial security to maintain their social and affordable housing, or achieving home ownership through shared equity products, or independently.